Our 21 Key Badge One Pint Pewter Tankard measures 5.11 inches tall by 3.14 inches wide. This makes them the perfect commemorative gift for landmark birthdays. 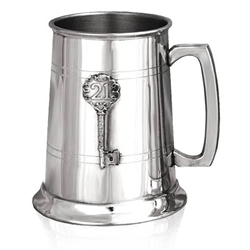 This one pint pewter tankard is specifically designed to be the ideal gift to mark a special someone's 21st birthday and features a key design complete with the number 21 along with the stylish horizontal line detailing on the straight sided body. The square handle gives the tankard a feel of modernity making it perfect for the younger recipient, and our expert engraving service can make this a truly unique gift.